A Comic-Con Diary: The Final Day Glen Weldon talks to Comedy Bang Bang's Scott Aukerman, contemplates the rise of geek culture, and gets a Batmobile. 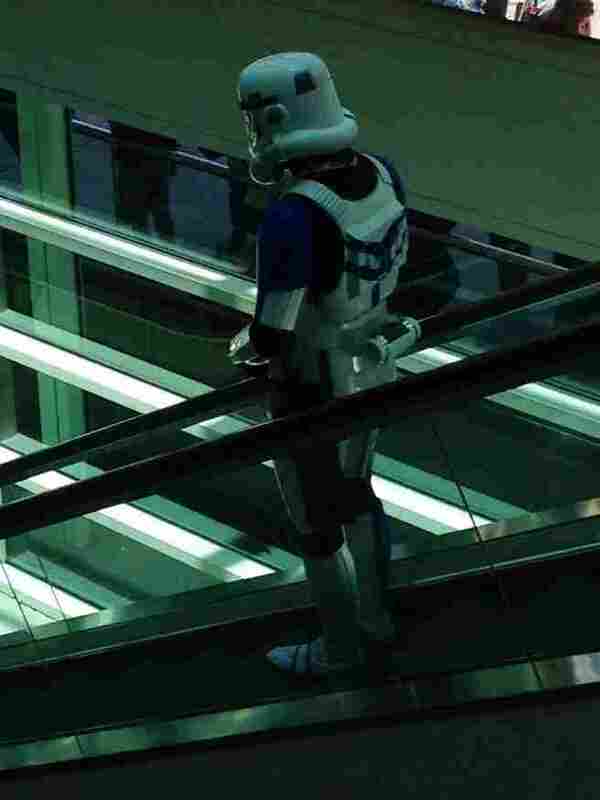 A lone, sad stormtrooper descends an escalator. I've had three hours of sleep. My energy is low, my coherence lower — I spend long minutes talking about the Eisner ceremony, and Will Eisner's dream of a world in which comics are appreciated as a medium for all kinds of storytelling, not just superheroes, and I know as I'm saying it that none of it will make it to air. I also stop and start more often than I usually do (you try scrolling on a MacBook trackpad with your elbow), but Rachel's great and easy to talk to. Our 10-minute conversation will become a three-minute one by the time it airs the next morning. I hang up and stare across the bay at the San Diego Convention Center. I've still got most of Friday to write up, but I've got to get ready, grab breakfast and catch the 9:30 a.m. water taxi to meet comedian/podcaster/talk show host Scott Aukerman for an interview at 10:15 a.m.
And although Comic-Con won't wrap up until late tomorrow afternoon, today is my last day; we're flying back to D.C. first thing in the morning. I've spent so much time introducing myself to publicists and creators at various booths that I haven't had any time to, you know, buy anything. This, I resolve, cannot stand. 9:25 a.m.: On the dock waiting for the water taxi. No cosplayers in the line this morning, either. Dang. I strike up a conversation with my fellow line-waiters, noting that overnight it's grown more difficult to do so than it has proven these last few days. It's as if my brain has already begun the process of readjusting to life beyond Comic-Con, and old attitudes — like finding chattiness exhausting — are starting to click back into place. One of the main topics of conversation at Comic-Con, once it's been running for a day or so, is What You Missed: the panels, meetups, parties and events that happened on the previous day which you couldn't attend. It's not a smug, lording-my-experience-over-you dynamic, but a genuine, and genuinely rueful sense of community, borne out of the sheer scope of the Con itself: No one can do it all. Here's the part of the elephant that I saw. What did you see? 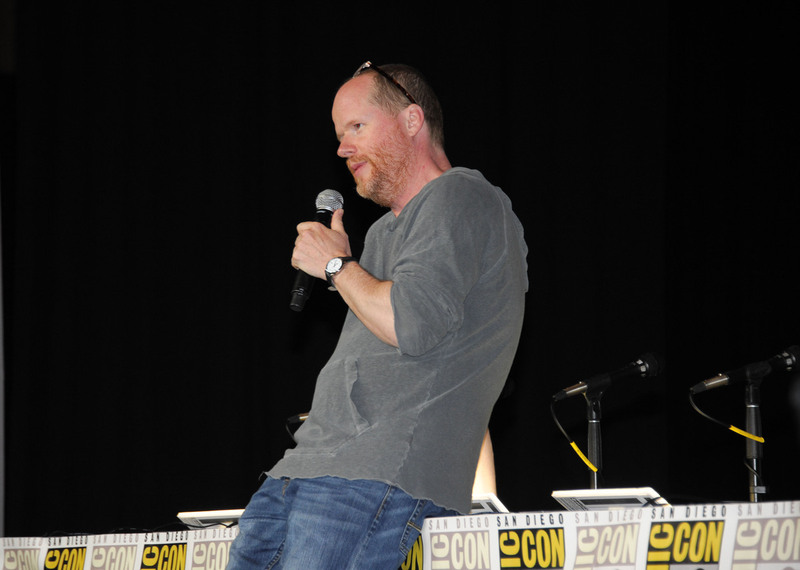 Joss Whedon speaks at the Dark Horse panel. Whedon's properties for the comic book publisher are related to his television shows Buffy the Vampire Slayer and Firefly. 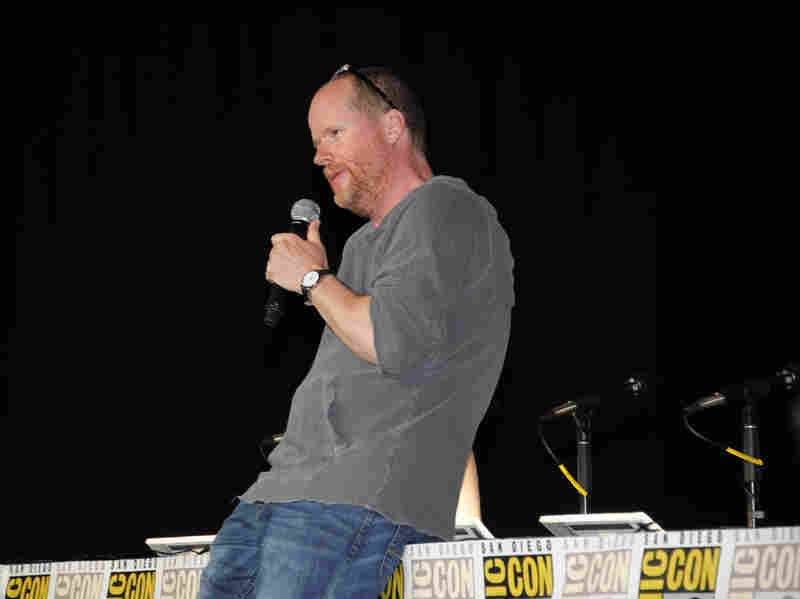 This is how we learn of yesterday's Dark Horse Comics panel featuring Joss Whedon, who began by discussing the various Dark Horse titles over which he holds creative control, but who soon began talking about anything and everything. "He seemed a little wiped," we are told, "a little out of it, and he just started ... going off." A creator with a loose tongue is a rare thing, let alone one who occupies the nexus of so many fandoms. Panels — especially the big Hall H panels — can seem so much about pumping up the brand that fleeting moments of human connection, like the one now being so lovingly described by this bald dude in a Gundam t-shirt, are prized. "There was no line," Gundam guy says, incredulously. "I just walked right in." One of us, a zaftig young woman from Laguna Beach who's come every year since she was 9, makes a soft, sad sound of protestation at this news — a quick, impatient, vaguely beagle-y whine. "Get out," she says. For this is the cruelest, deepest cut; the rest of us spend the short boat ride commiserating that we simply assumed that any panel featuring Whedon would be thronged, would require a wait of hours, so we skipped it. At the last minute, a cosplayer does board the boat: A young man with paper airplanes affixed to a black business suit. He explains who he is ("It's from a Pixar short? The one before Wreck-It Ralph?") to a skeptical middle-aged couple from Scotland. 10:15 a.m.: Scott Aukerman and I have found a quiet table in one of his hotel's weirdly multiple lobbies so I can ask him some questions. Aukerman hosts IFC's exquisitely surreal Comedy Bang Bang, a talk show dosed with bits of long-form improv and the very non-est of sequiturs. It's a show whose singular sensibility I admire greatly, and I ask him about his influences (early Letterman, Pee-wee Herman) and how he set out to make the IFC show a wholly different beast from his innovative — but decidedly looser — podcast of the same name. All questions he's answered before, but he's articulate and forthcoming about his thought process. I mention how the IFC show's absurdist take on the talk show format feels strangely vigorous and new, and ask him if he thinks, given the fragmentation of media, that the standard late night talk show --– which exists to trot out the third lead from NCIS and have her tell an amusing anecdote about her trip to Mexico — has long to live. And whether it might be time for something else to take its place. Something bolder, more challenging, and more cleverly, thoroughly wrought. Something like, say, Comedy Bang Bang. He demurs, politely, noting how much work goes into producing a daily talk show. So I may be oversimplifying to see Comedy Bang Bang as a mission statement, a declaration outlining television's Great Way Forward. But whatever it turns out that Aukerman's show is saying, it's something that American television hasn't really said before, which is reason enough to watch. 10:30 a.m.: Before I take my leave of Aukerman, I ask him the questions I've been asking everyone this week: WHY has nerd culture grown so huge? WHY is geeking out now so commonplace, as a means of interacting with the world? A child dresses up as Star Wars' Boba Fett. I've gotten lots of different answers to these questions, but I've noticed, unsurprisingly, that the answers seem to be function of perspective. To the comics pros I've talked to, it's simply that the wider world finally discovered the appeal of comics. Now that movie special effects can reproduce comic book action without looking cheesy, the enduring joy and wonder of these characters and stories can be seen and enjoyed by all. 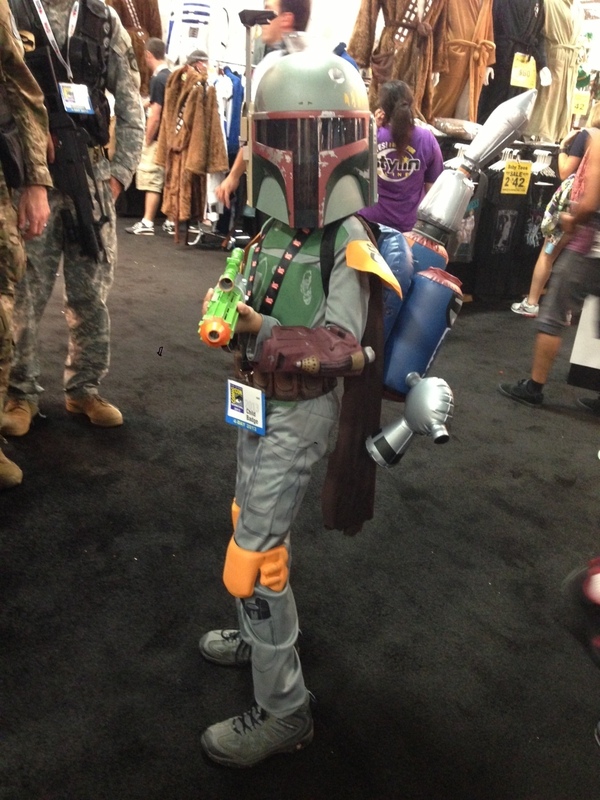 To many of the fans I've talked to, especially those couples who come to Comic-Con in themed costumes with their kids in tow, it's a family thing. Their parents were/are nerds who instilled in them a love of nerdy pursuits. They love the things they love, the things that brought them together as a family: My generation had Monopoly. Theirs has Minecraft. To the bloggers I've talked to, it's the Internet that changed everything. They were nerdy kids loving the thing they loved for their reasons, and then one day they found a message board or website that told them You Are Not Alone. Communities formed, communities which not only accepted you, but reinforced your nerdiest behavior traits. You found a real home. All of these answers, and many more, are perfectly correct, of course. Because cultures are untidy things which grow and thrive for a host of overlapping reasons. But Aukerman is the first person I've talked to who puts the rise of nerddom in a wider sociopolitical context. "We were the first generation without a draft," he says. "We didn't need to worry about life and death, so we devoted that time and energy into obsessing over this TV show or that comic." This "Lamest Generation" theory is one that I appreciate, having spent so much of the last few days imagining how Comic-Con would seem to my dour, Welsh immigrant, came-of-age-in-the Depression grandparents. 10:45 a.m.: One of those happenstance meetings I keep hearing about. I join a breakfast table of comics/book industry bloggers I've never met but whose work I've read with admiration for years: Heidi MacDonald of Publishers Weekly and The Beat, librarian and tireless comics advocate Eva Volin, and manga mavens Deb Aoki and Brigid Alverson. These women have pointed me to many of my favorite books — books I likely would otherwise never have found. Later in the afternoon, I'll grab a few minutes with Graeme McMillan of Time.com, Comics Alliance, and many other sites. I find these conversations downright energizing, heartening and thought-provoking — unlike the ones I've been having with (perfectly nice and interesting) creators and publicists, which seem merely dutiful and network-y. Huh. Field for study there. 12:30 p.m.: I am sitting in the Marriott bar attempting to write up the events of the past day, and failing miserably, and growing more anxious with each minute that passes, because sitting in the bar writing about a thing means I'm not, you know, EXPERIENCING the thing, and the more time I sit here not experiencing the thing the less of the thing I'll have to write about tomorrow. At least, in theory. In fact, Comic-Con being Comic-Con, this time alone in a crowded bar offers me a glimpse of a side of the event I haven't yet experienced: The professional, schmoozy, deal-brokering side. Over the course of the next two hours I overhear two pitches. The first one seems successful; it begins with two people meeting at a previously agreed upon time and ends with a handshake. The second one is more opportunistic in structure — basically the pitcher stumbling across the pitchee sitting alone at the bar sipping a beer and chatting him up for the next 15 minutes. Pitcher's idea is dense and involves "taking [long-established character X] in whole new direction" because "no one will see it coming." The hapless pitchee looks pained, and throws longing looks at the exit. The meeting ends not with a handshake but with the pitchee abruptly excusing himself and leaving his business card behind. You know how when Looney Tunes' Witch Hazel would click her heels and disappear, she'd leave a few bobby pins floating in the air after her? That. Pretty much that. A publicist orbits the bar like a furious, pant-suited telecom satellite, whispering hotly into her phone to demand updates at five-minute intervals from the poor sap driving her client to the convention center. Superman Family issue #179 was originally published on October 1976. 3:00 p.m.: Back on the con floor one last time. Later I will learn that several celebrities are secretly stalking the floor with me, including Doctor Who's Matt Smith (in a Bart Simpson mask) and Breaking Bad's Bryan Cranston (in an oversize Walter White mask). I don't come across them. 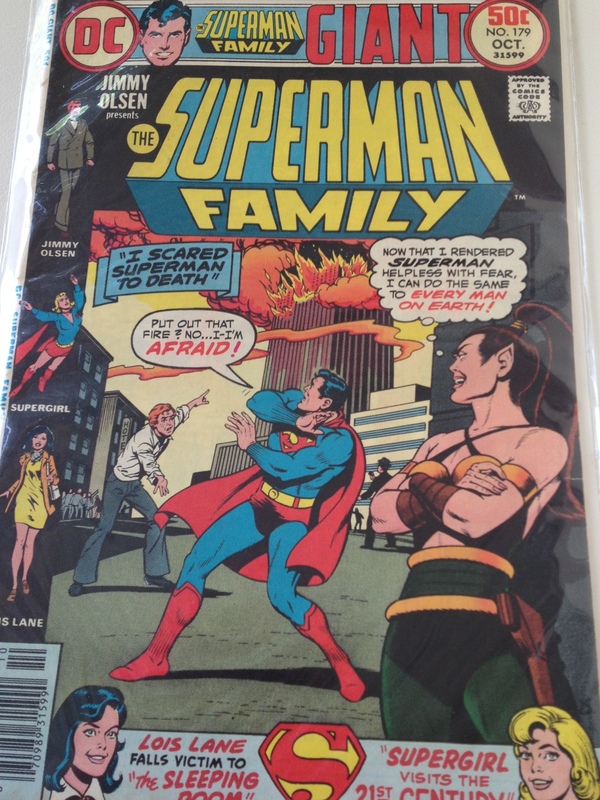 Instead, I find the comics dealers and proceed to search for the very first comic I ever bought as an 8-year-old kid: Superman Family #179, with a cover date of October 1976. I find it in no time and happily plunk down $10 – roughly 20 times what young, tow-headed Glen paid for it, back in the day. On the cover, Superman is terrorized by exposure to a mysterious agent administered to him by an evil alien warrior-woman. Said space-Amazon, I can't help but note, looks to these 45-year-old eyes rather uncannily like notable drag queen Varla Jean Merman. OK wow just ... lots to unpack there, given world enough and time. And therapy. I find some more comics for my Tumblr (which I'm using as a sort of visual companion to the Superman book), including a Vartox story and some old issues of pearls-and-pillbox-hat-era Lois Lane, featuring that classic Kurt Schaffenberger art I love so much. I turn and nearly collide with a mass of caped flesh I'm reasonably certain is the very same improbably muscled 300 Spartan that Chip Kidd so wittily salivated over last night at the Eisners. Dude's found a reasonably empty section of the floor and just stands there, looking around expectantly, waiting for someone to take his picture. But by Day 3, the crowd's seen all manner of things, and his simple eight-pack and spear isn't cutting it. I feel for the big lug. Feel for. Not up. For. On my way out to meet F and Maggie for a drink, I stumble across the kind of weird serendipitous scene at which Comic-Con excels. A young girl in a huge motorized wheelchair is beaming as she poses alongside a guy towering over her, encased in a giant cyborg exoskeleton. She looks from her chair to his mech-suit and back again, and laughs. 4:00 p.m.: "You just need to be a better fan," Maggie says. She's chiding me, in her gentle, maternal way, because I'm not enthusing enough. I'm on my second beer and I'm trying to process the experience of Comic-Con. She's asked for my reaction to it all, and I'm finding I don't have just one. Which strikes me as only fitting, to a stimulus as huge and multi-faceted as this. Certainly, the species of unguarded joy I've seen on the floor is invigorating. I've watched disaffected, snot-nosed teens grow suddenly voluble and prone to outbursts like "I am so freaking excited right now," "This is the most awesome thing I've ever seen," and "YO, PIMP VADER!" But seen up close, it hard to miss how thoroughly the engine of Comic-Con is fueled by a propriety blend of unself-conscious enthusiasm and its cynical exploitation. Buy a vintage comic priced at $10 for five bucks at an "ALL COMICS 1/2 PRICE TODAY!!!" booth, take it home and remove it from the bag, and find an inner bag with its actual, $5 sticker. On the one hand: Caveat emptor, ya dumb emptor. On the other hand: Seriously, nerds? Maggie is sorry she didn't get to introduce me to more of her friends, the writers and artists who created some of the characters, and who've told some of the stories, that I grew up on. This is a large part of what Comic-Con is about for her --those moments to catch up with creators who have long ago become close friends and, as is her wont, enthuse. She is a discerning enthusiast, it must be said, but when she's on, she's on omnidirectionally. "Do you know about Barnaby?" she asks suddenly, and I assume she's talking about one of the 26 obscure Silver Age artists on her speed dial, but no, she's talking about a comic strip character. She pulls from her bag a new Fantagraphics collected edition of a 1940s strip by Crockett Johnson (who'd go on to do Harold and the Purple Crayon) featuring a young boy and his disreputable, cigar-chomping guardian angel. I realize I've got the book at home, where I months ago consigned it to the towering to-be-read pile, and inform Maggie of this fact. She will not be dissuaded. "Read it," she says. Firmly. "Just the first couple pages. I'll wait." I do so, and of course it's utterly charming, and funny, and gimlet-eyed in a wonderful and surprising way. "It's so well-constructed," Maggie says, and she's right; I resolve to move the book from the to-be-read pile to the read-it-now pile as soon as I get home. But I realize that I'm not sad that I haven't met more of Maggie's friends. Because — and this may be nothing more than simple arrogance — I realize I don't think of myself as a fan. Not anymore. I think of myself as a critic — a book critic, a comics critic, and even, on a good day, a (arrogance again) cultural critic. Because the thing that matters to me is the art, not the artist. F and I are headed back to the hotel, where we'll get dinner and go to bed early, because I've hit a wall. The tireless Maggie is headed back to the floor before it closes for the day. "There's always more," she says, brightly. "Yes," I say, "that's the problem exactly." Sunday, 7:05 a.m. PT: "It won't fit," F says. He's talking about the Batmobile, my hard-won (if we define "hard-won" very, very loosely) prize from Preview Night. We deliberately left extra room in our carry-on bags on our trip out to San Diego, to allow for Comic-Con purchases. But the box the Batmobile comes in is over two feet long. It won't fit. "You okay with taking it out of the box?" F asks. Of course I am. I'm not that guy. I pride myself on not fetishizing the physical object; I never bagged and boarded my comics (and have now switched entirely to digital), because they were stories, stories meant to be read. As a kid, I'd rip my action figures from the box without a care, because they were playthings, not lookat-things. And yet I blanch. For only a moment, but a long moment, I seize up at the very thought. Is this what Comic-Con has done to me? Turned me into a guy who worries about things like Mint in Box? No. I will not permit it. "Do it," I say. But I don't, can't look. 9:35 a.m. PT: Gingerly I stuff the bag containing the Batmobile into the overhead bin. F informs me he's wrapped it carefully in layers of t-shirts and dress-shirts. "It'll be fine," he says. 6:35 p.m. ET: Storms along the East Coast divert our flight from Atlanta to Huntsville, Ala., where we wait on the tarmac for two hours to refuel. All traces of Comic-Con fade as the world of Normals — and its practical, prosaic, entirely non-fantastic concerns — reasserts itself. A model of the Batmobile from the 1960s live action Batman television show, starring Adam West and Burt Ward. In the row ahead of me, a guy in a golf shirt turns to the flight attendant. "Been raining so much," he says, "I can't cut my lawn." The flight attendant nods in sympathy. "Keeps growin'," she says. The pang of loss I experience at this moment is real, and it hurts. Monday, 8:15 a.m ET: We made it home at 2 a.m., but now it's time to head to the day job, where I will be spend the next eight work-hours groggy, non-communicative and out-of-sorts. But before I head out, I unpack the Batmobile. It's the first time I've had a chance to really look at it. It's made it through without a scratch, and it's a thing of beauty, no question. Larger than I anticipated. 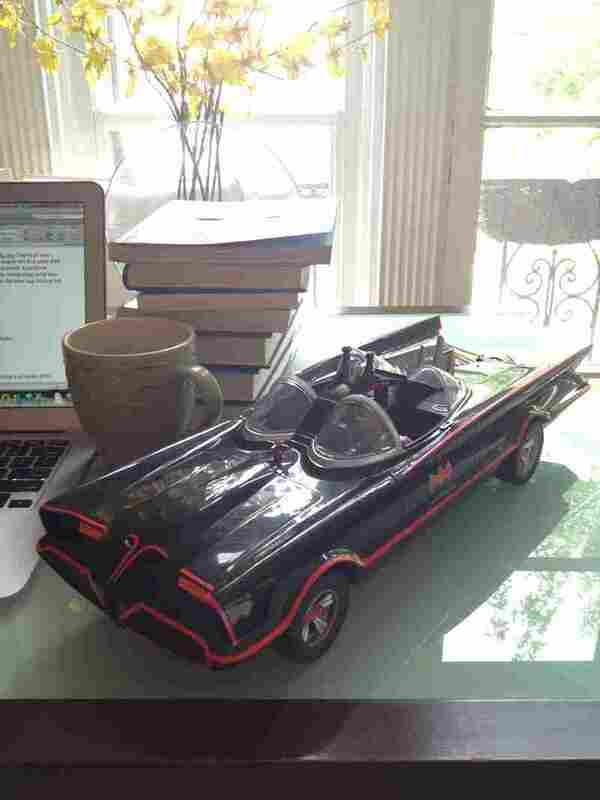 I place it gingerly on my writing desk, where it will occupy pride of place (second only to coffee) as I write my next book, which is about the rise of nerd culture, and Batman's role in it. The introduction will be all about Comic-Con, informed by the discussions I've had and the thoughts I've thought over the past week. I'm calling it The Caped Crusade.